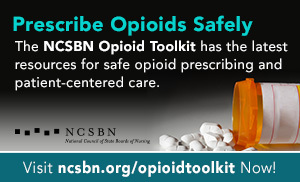 NCSBN offers the following resources on substance use disorder to members, educators, nurses, and students. Substance use disorder (SUD) is rarely discussed on nursing units. It is the responsibility of a nurse manager, however, to provide education, dispel myths and take action when needed. This brochure outlines the roles and responsibilities of the nurse manager in situations involving SUD. Poster: Substance Use Disorder (SUD) in Nursing: Break the Silence. This poster is designed to bring awareness about SUD to nursing leaders, as they have an important responsibility — to keep patients and staff safe, while maintaining high standards of care on your nursing unit. This is a companion piece to the brochure A Nurse Manager’s Guide to Substance Use Disorder in Nursing. Poster: Substance Use Disorder (SUD) in Nursing: Be Aware. Get the Facts. This poster is designed to help nurses educate themselves about SUD changes, physical signs and signals will help not only their colleagues with SUD, but also protect patients. 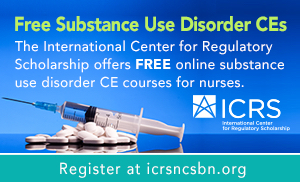 This is a companion piece to What You Need to Know About Substance Use Disorder in Nursing. This self-paced course will help you acquire the attitudes, skills and knowledge you need to compassionately get colleagues the help they need, while protecting the public. This self-paced course will prepare you to proactively take the lead in prevention, detection and intervention.